Nick Nielsen studies civilization from the perspective of big history and is especially interested in extrapolating the large scale structure of spacefaring civilization. He spoke at the 2011 and 2012 100YSS symposia and at the 2013 Icarus Interstellar Starship Congress. 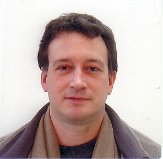 He is also a regular contributor to Paul Gilster's Centauri Dreams blog and writes two blogs of his own.